country club gangsters - who is nicka smith? today i spent some time thinking about one of the first documentaries i ever saw, gang war: bangin’ in little rock. this documentary was part of the america undercover series on h.b.o. and was initially aired in 1993. the piece followed the pulaski county coroner, dr. steve nawojczyk, as he and his community dealt with the rise of gang violence in the city of little rock, ar. one of my mother’s parental tactics was to take me and my sister on “inner city field trips” so we could see what life was really like there. my parents left the south side of chicago because they felt it wasn’t the best place to raise children. they wanted more opportunities for us. since they did so, my mom felt as though she didn’t want to deny me and my sister the opportunity to see the life, but not live it. helicopters. gunshots. hearing that someone got shot. so-in-so is dead. i don’t really ever remember playing in front of our family friends’ houses whenever we would go on these visits. i remember spending a lot of time in the house. i remember having a lot of fun, but also being grateful that i had another home to go to. food for thought. i know i can’t assume that i’m the only one who had these “field trips” but a large number of people i know had parents that talked to them about their childhood and the differences that existed. the time old “i had to walk 3,675 miles in the snow to go to school” story. i was happy that i could walk into the bathroom and turn the water on to take a bath and didn’t have to chop wood, pump the water, heat it up on the stove, and put it in a number 2 tub to bathe. i could go to any college i wanted. i could vote for whoever i wanted, without threats. yeah, that sort of thing. we can’t blame it all on rappers like lil xyz, rick qrs, and dj mno. even they have been fronted off for having the same background as a regular person. what i don’t understand is this. what made being a normal, responsible person so out of style? best believe that lil xyz, rick qrs, and dj mno have accountants (well, they should). they pay taxes (yep, they should do that too). they can read (i REALLY hope so). more importantly, they all know about their brand, and that negative activity and press is all bad for them because it hurts their bottom line, read that money. why is it that we aren’t effectively teaching our kids brand management or as my mother says “home training?” if you act like you have no home training you lose out on opportunities, you leave a bad impression of your family (God forbid), and you get stereotyped. when i was a teenager, gangsters didn’t wear skinny jeans, vans, and tight shirts. 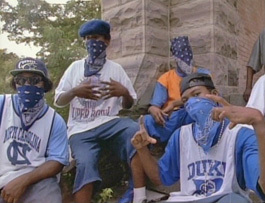 they wore loc sunglasses, dickies and ben davis. you could distinguish between the real g’s and the ones that weren’t g’s. now, there is no distinction because everyone considers themselves one. it’s like when a crime takes place. they’re looking for a “young african american male with dreadlocks in a white t-shirt.” that’s a ton of young men in the bay area. some of them haven’t done a thing wrong in their lives, but yet they are a target. what would distinguish them from the young men who haven’t gotten it together yet? in my opinion, it would be the fact that they didn’t use boyz n da hood, juice, menace ii society, new jack city, and set it off as a standard to live by. they know that all movies are scripted, usually by people who haven’t lived the lives of the characters and that they have definite endings. real life is different.